If the needle seems too long, remember that you can vary the depth and/or angle. If you're wearing the belt on your waist or hip, try sliding the belt forward or backwards. If you're wearing it on your thigh, sliding it to the outside will allow you to sink the needle in further. 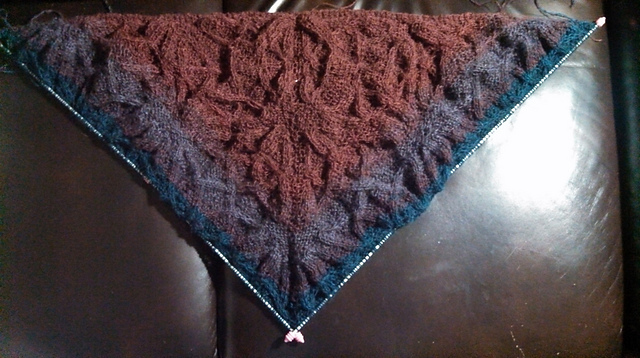 Shawls can be knit on two or more DPNs using rubber needle tips. Let's say that you have two needles, needle B is crammed full of your live stitches and needle A is your empty needle. Let's assume that you're using the belt with your empty needle jammed in your belt and you're throwing the yarn with your right hand. You'll start stitching from right to left as usual. At some point, halfway down needle B (the left needle), you decide it's time to split the stitches onto two needles. Pull needle A out of the belt (half filled), and put two rubber ends on both sides. Grab a third needle, jam it into the belt and continue working the rest of the stitches on needle B. When you finish the row, pull needle B out of the belt, and put two rubber ends on both sides. You'll now have two needles filled with live stitches and one empty needle. Put the needle into a new hole. You'll have to wiggle it into the mesh to make a path. If you like the hole you're using, you can use your needle to move the mesh around inside the pouch. You can then make a new path. **Jam needle A (the empty needle in the belt). Remove a rubber end, stitch across needle B. Remove the rubber end on needle C and knit two or three stitches. Pull needle B out and put the rubber ends on both sides of that needle. Put the empty needle in the belt, and stitch across needle C. When you reach the end of your row, put rubber ends on both sides of both needles. ** You'll then turn your work for the next row and repeat **. The reason you'll want to knit two or three stitches from needle C is to prevent laddering, the stretching of stitches between the two DPNs. There's a photo on this web page. You can also use multiple needles on projects such as socks and sweaters. One raveler in this forum thread said, "I have six of these needles - when I started this I was using 5 needles but that got to be like hugging a porcupine". It gave me quite a chuckle. Don't worry, folks. You'll get the hang of it!! Okay, turn your work and lay it down in front of you. With the working yarn on the right, you'll now have two needles half full of live stitches and an empty needle. From left to right, we'll call that needle C (half full of live stitches and two rubber ends), needle B (half full of live stitches and two rubber ends), and needle A. When you get on a roll, you won't need to put the rubber ends on, but in the beginning, it's good to get in the practice of doing it just in case.